It was the first time the Turf City site had been used for the national championships, but most of the competitors were familiar with the trails thanks to the Cycosports Jungle Cross series. The circuit has radically changed since it was first raced upon in late 2015, with an ongoing program of improvements bringing it up to UCI championship standards. The Jungle Cross layout might be as “flowy” as the traditional nationals venue at the Bukit Timah Mountain Biking Trail, but it’s still a true test of skills and is an excellent location in terms of spectating with a large area of permanent tenting providing shelter for the supporters. The elites faced six laps around the 4km-long “pro” version of the course, which thanks to a week of rain, a late-morning, race-day squall and the races on the undercard churning it up beforehand, was a fitting muddy mess for the nation’s best cross-country cyclists to decide who was top dog for 2018. Slightly disappointing was the fact that only eight competitors were on the start line, but quality made up for the lack of quantity, with two-time defending champion and hot favourite Junaidi Hashim (Team Awano Treknology) leading a stellar field. Brown and Razif Salleh (Harding MTB Racing Team) were expected to be the main competition for Junaidi, but Salleh’s race was nearly over before it started, the big Malaysian only making the starting grid with seconds to spare. The race opened with a stretch of grass playing fields which allowed for a speedy start that lined out the riders before they plunged into a jungled ravine full of drop-offs, jumps, climbs and lots and lots of mud. Midway through the first lap Junaidi had opened up a 15-second lead on Brown, with Salleh following closely behind, but by the time the race re-emerged out of the ravine onto the grass, it was Brown who was in the lead. The first of what turned out to be a string of mechanical problems had slowed Junaidi, and by stopping at the technical zone to try and clear his drivetrain problems, he allowed the Cannasia man to extend his lead to over a minute. There aren’t many opportunities in the jungle section of the course to gauge the relative position of rivals, but the extended playing-field section provides exactly that, and by the end of his second lap the expression on Brown’s face looked like one of disbelief as he searched for rivals but only saw daylight. With a third of the race done, his lead was around two minutes. Junaidi was still having problems, but he wasn’t the only rider to suffer from the mud and it seemed like a gang of chain-sucking demons were camped out in the jungle judging by the numerous scenes of riders off their bikes attending to mech issues. Brown wasn’t spared either, but with the luxury of a big lead by midway through the race, he was able to ease up the pace until he could work out which gears he could use where and when on the rapidly deteriorating course. It was a masterly ride from the UK-born Aussie and he gradually extended his lead lap by lap, to the to the point where he had a 5-minute advantage by the time he heard the bell for the final lap. A careful but still faster than anybody else’s final loop around the circuit saw Brown take the chequered flag with a winning time of 1 hour, 44 minutes and 52 seconds. Junaidi followed some 7 minutes later to finish as runner-up and the major consolation of clinching a third straight national championship title as the fastest Singaporean. An illustration of how testing the conditions were is the fact that Salleh finished third but two laps back from Brown and Junaidi. Brown was an exhausted but happy man as he rolled off the course to be greeted by his family and our microphone. “It feels good actually! It was a tough race, but you have to ride to the conditions, it was slippy, it was good. You know I think everybody had mechanicals, Junaidi had a big mechanical, but I also had mechanicals all the way through, I lost second, third, fourth, the chain was dropping, it was slippy, but it was fun. So, happy? Very happy,” the champ said. We asked Brown how it felt to get a rare win over Junaidi, who has beaten him many times. Hitting the racecourse two minutes after the elite Men were the Under 23s, and it’s from that race that perhaps the biggest story of the day came. Having won the downhill national title the previous day at Kent Ridge and the road racing crown two weeks ago on the Nongsa circuit in Batam, Riyadh Hakim (Team Awano Treknology) was attempting to clinch an unprecedented triple. The chances were always high that the young gun would accomplish the feat as he has shown himself to be at least the equal of his Brown and his mentor Junaidi in head-to-head cross-country contests over the past 12 months, but mountain biking is a tough sport and nothing can be taken for granted. Indeed, he didn’t have things his own way, with teammate Aidil Taufid pressing him hard yesterday to the point where he was still hot on his back wheel at the end of lap #3, but ultimately Riyadh’s class shone through, and he claimed his triple crown comfortably in the end, crossing the line with his trademark wheelie in a time of 1:28:42 after his five laps of the circuit. The gap to the runner-up Taufid was over 5 minutes, with the third-place rider Luqmanul Hakim (TWC Racing) a further 7 minutes back. We asked the triple national champ which one of his titles gave him the most satisfaction. Tsalina Phang also suffered mechanic issues on her way to winning the women’s national title, but the triumph was never in doubt as long as she finished as she was the only entrant. Phang is an accomplished mountain biker, and would probably have won anyway if other ladies had entered to test her, but it’s a shame that none did so. There are plenty of women out on the trails every weekend, but something has to be done to entice them to pin on a number and race. The picture wasn’t any better in the female age group races, with both the Masters and Super Masters contests also only being contested by single riders. Still, the record books will show for posterity that Shirley Teo (MatadorRacing) and Louise Donaldson (Singapore Bike Hash) were the respective winners so huge congratulations to them for putting in the hard, championship-winning efforts. The men’s age group racing didn’t lack for numbers, with the the Junior A, Junior B, Masters and Super Masters races all staging competitive contests. The Junior B race for 15- and 16-year-olds opened the action, with Jack Stewart (West Coast Riders) outlasting Abdul Haziq Johari (Harding MTB Racing Team) after the pair enjoyed a ding-dong battle throughout their four-lap contest around the slightly easier “sports” version of the MTB course. Another Harding rider, Saiful Nizam Helmi, finished third, although he had actually been winning the race through two laps, before fading on lap #3. With the winner Stewart being an American, Johari took the national title as fastest Singaporean. Next up were the cyclocross riders who for the first time on the Jungle Cross layout were given a “proper” CX layout to race on, rather than being asked to ride a modified version of the MTB circuit. Taking advantage of this new emphasis on cyclocross-specific technical skills was seasoned racer Robert Lamb (Stinner Bicycle Club), who put in a wire-to-wire performance to win the six-lap race in a time of 38 minutes and 22 seconds. The victory was especially sweet for Lamb as he’d finished on the podium many times at Jungle Cross races but never on the top spot. The runner-up was Bastian Dohling (Specialized Roval Mavericks), who managed to stick with Lamb for the first lap, but then had to watch the winner steadily extend his lead lap by lap. He finished some two-and-a-half minutes behind Lamb, with third place going to Alistair Reed (Berwick Cycles), a further 37 seconds back. The winner of the first ever Singapore Cyclocross National Championship was the fourth-placed rider B.C. Tan. There were three entrants for the Women’s Cyclocross race, with Anna Symms (MatadorRacing) emerging as a comfortable winner from Stephanie Lim (Anza Cycling) and Maxine Chen (Singapore Barbarians). Chen took the Singapore national title. The Men’s Super Masters (45+ years) were tasked with completing four laps of the “pro” course and Alvin Lim (Team Entro Cycling) emerged as the race winner and national champion after he put on an excellent performance, which included the fastest lap of the day on the “pro” course across all categories of 14:57. Admittedly the Super Masters being first on the extended track had the best of the conditions, but hats off to Lim for a dominant ride and winning time of 1:05:25. The runner-up was Dan Smith (MatadorRacing), but he finished 4 minutes back from Lim, with Kim Kwee Ng (Cannasia Absolute Black Racing) taking the final spot on the podium a further half a minute behind. The All Mountain racers shared the track with the Super Masters XCO riders, although the long-travel exponents faced just three laps round the “pro” course. 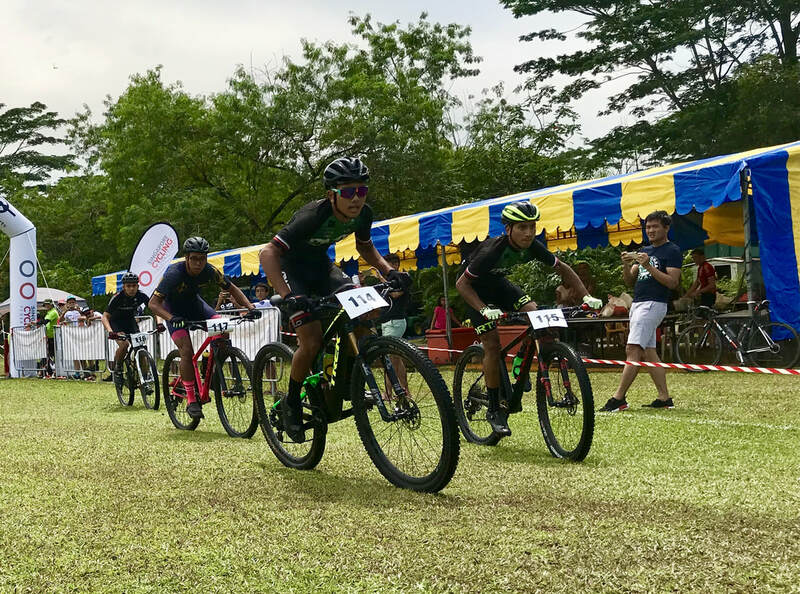 The pointy end of the action contained a thriller, with Rohaizat Mohd Hashim (Harding MTB Racing Team) only prevailing over teammate Mohamad Shafiee Salim by 1.6 seconds. The closeness of the race was further shown by the third-placed rider Wee Chong Yaw (Indomie Chicken Chop) only being 23 seconds off Rohaizat’s 52:36 winning time. With the winner being a Singaporean, he was also crowned the national champion. The afore-mentioned short but sharp storm hit the course during the fourth round of action when the Men’s Masters (35-44 years) and Junior A (17-18 years) were on course. Both sets of racers faced four rounds of a much muddier circuit. Mohamad Faizal Rawi (Twenty9er Racing Team) enjoyed a testing first lap battle with teammate Mohamad Khaniz Omar, before pulling away during lap #2. He went on to take the victory in a time of 1:07:06, which gave him a national championship winning advantage of a minute over the runner-up Herman Mohd Arsek. Khaniz joined them on an all-Singaporean podium. Arfan Faisal (Team Awano Treknology) successfully defended his Junior A title, which a few weeks ago didn’t look like being possible after a spill saw him suffer from fractures to both wrists. But young bones heal fast, and Arfan put on a dominant performance to take the the title with a time of 1:06:30. The Harding MTB Racing Team duo of Chong Qing Wong and Abu Hudzaifah Masnawi took second and third place respectively. 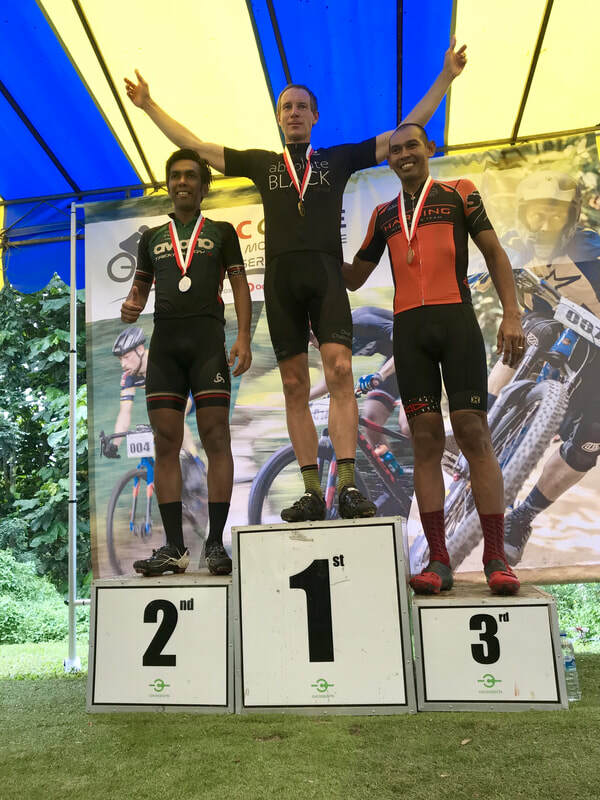 Full results of the 2018 OCBC Cycle Singapore MTB National Championships can be found by clicking on this link.